Drew Gill has worked at monster truck rallies, a Taylor Swift concert, and Hulk Hogan’s house. So no—nothing phases him in Georgetown. The Hannibal, Missouri native—also home to Mark Twain—has been a member of the Georgetown BID Clean Team for six years, but his prior resume reads like a modern version of the unusual Americana in which Twain reveled. Drew spent years as a member of the maintenance and grounds crew for some of the country’s biggest stadiums—from Tropicana Field to Busch Stadium in St. Louis and the former Houston Astrodome. Pop music concerts, baseball playoffs, monster truck rallies—he worked it all, and observed it all. After more than a decade in St. Louis, as well as six-month stadium stints around the country, Drew got a job at P&K Landscaping in St. Petersburg, Florida. His team served residents in the exclusive Bayway Isles neighborhood, including Hulk Hogan, Richard Fabrizi and shock jock Bubba The Love Sponge. Today, Drew’s days are less sharks, more street services. He moved to DC nearly a decade ago, and was in Georgetown three years later to get a new ID when he ran into a friend from church. As one of the Clean Team ambassadors, Drew’s day began at 4:30 a.m.—rain or shine, snow or sleet—cleaning the streets and answering questions. Recently, he was promoted to special projects, and serves as the lead for brick repairs, graffiti removal and landscaping. Each morning he preps his crew, explains the game plan for the day, and ‘attacks’ whatever it is he’s doing. 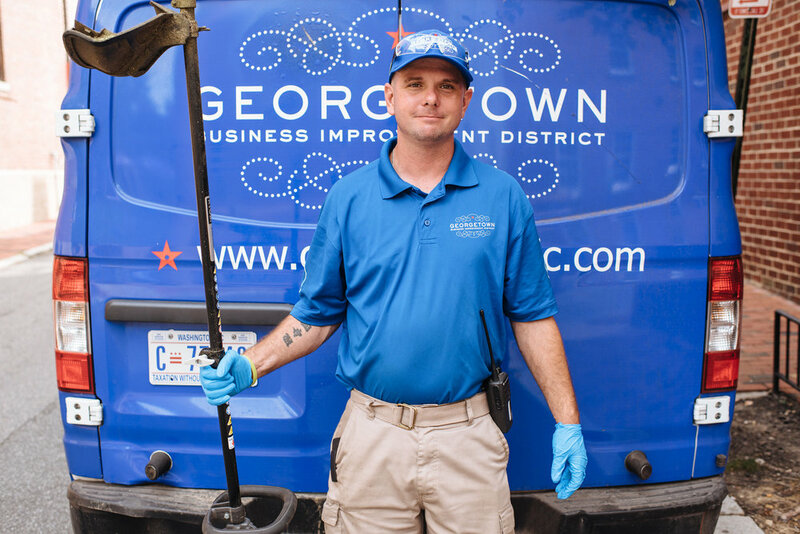 Drew has also worked nearly every Georgetown event at least once—from the Marine Corps Marathon to the Taste of Georgetown and French Market. Whether it’s an annual festival or an average Tuesday, visitors stop him frequently to ask for directions, ask what he’s doing, or ask about the BID. Drew misses the excitement of stadium work, the people in St. Louis and the weather in Florida (though he loves the snow), but he says there’s something special about Georgetown that he can’t explain.